Silent companion. Haswell makes it possible: HP offers a fan-less 13.3-inch notebook with the Spectre 13 x2, which transforms into a tablet with a push of a button. 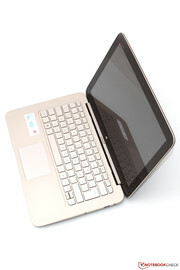 However, the bulky detachable is certainly no bargain with a retail price of almost 1,100 Euros (~$1485). 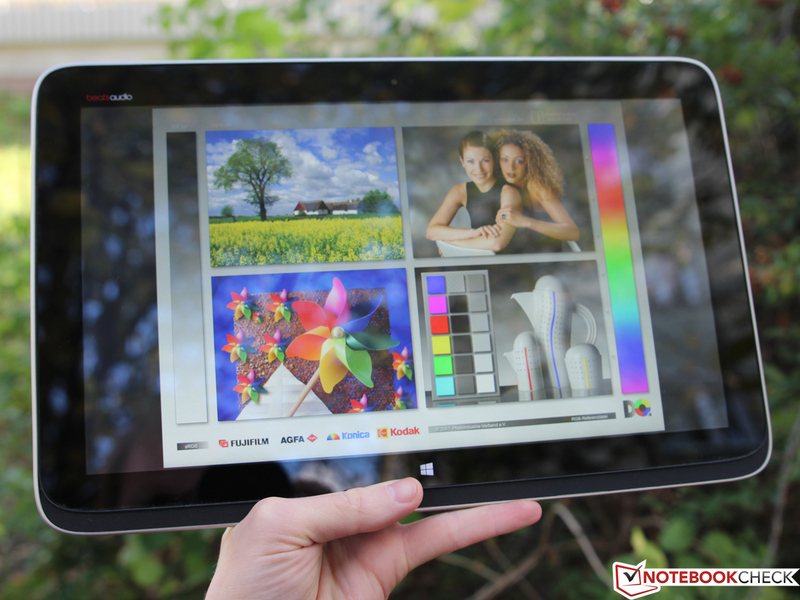 Devices with Windows are still niche products in the tablet market, which is dominated by Android and Apple's iOS. There are many reasons for this. Besides the additional costs and some technological limitations of Microsoft's operating system, missing x86 hardware, which combines good performance with a passive cooling solution, was one of the biggest problems. In the meantime, a lot has changed: Windows 8 is still not very popular amongst PC users, but is finally equipped with a user interface that works well with finger inputs. Intel also offers very frugal Core CPUs that are - contrary to older Atom processors - powerful enough for more demanding applications. 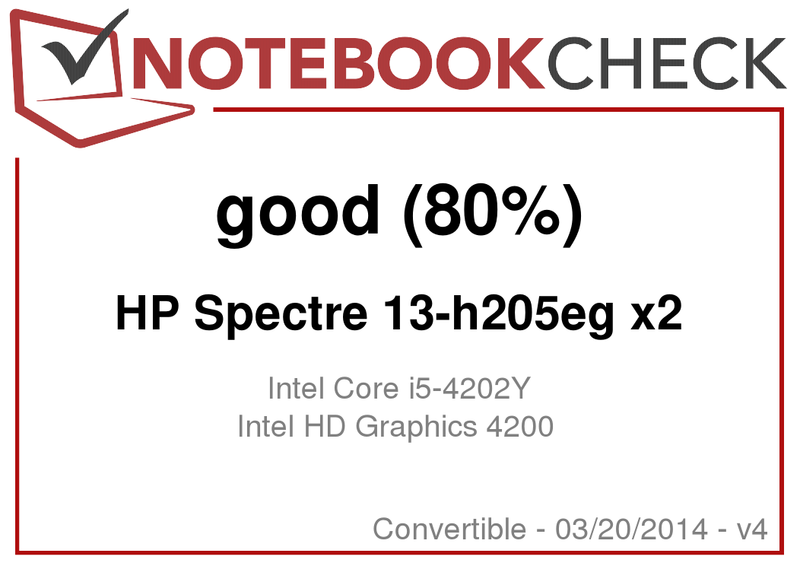 HP took all those ingredients and created the new Spectre 13 x2. 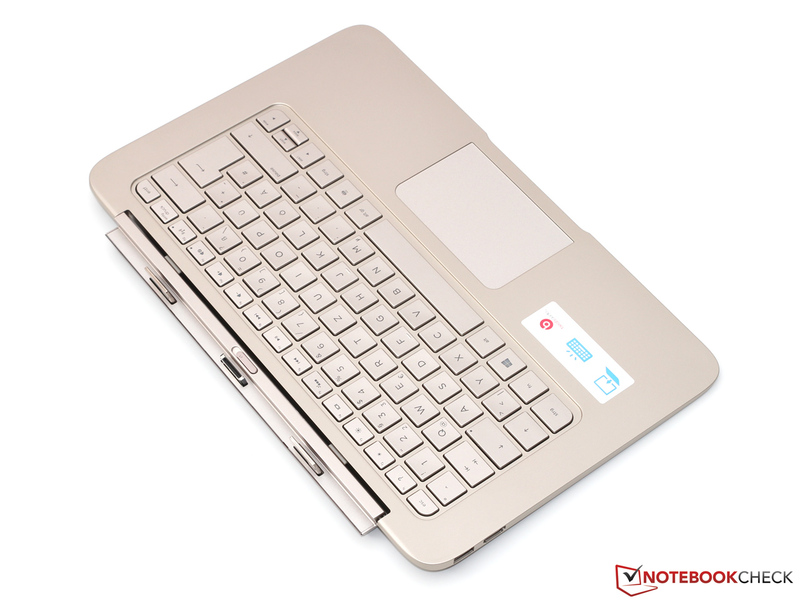 As a so called detachable, it not only can be used as a tablet but also as a full notebook in combination with the keyboard dock. 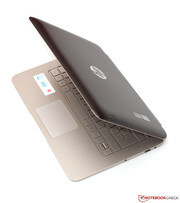 For the price of almost 1,100 Euros (~$1485) you get a Core i5-4202Y with 4 GB memory and a 128 GB SSD. A dedicated GPU is, however, not available, the graphics of the 13.3-inch Full HD display are handled by the integrated HD Graphics 4200. 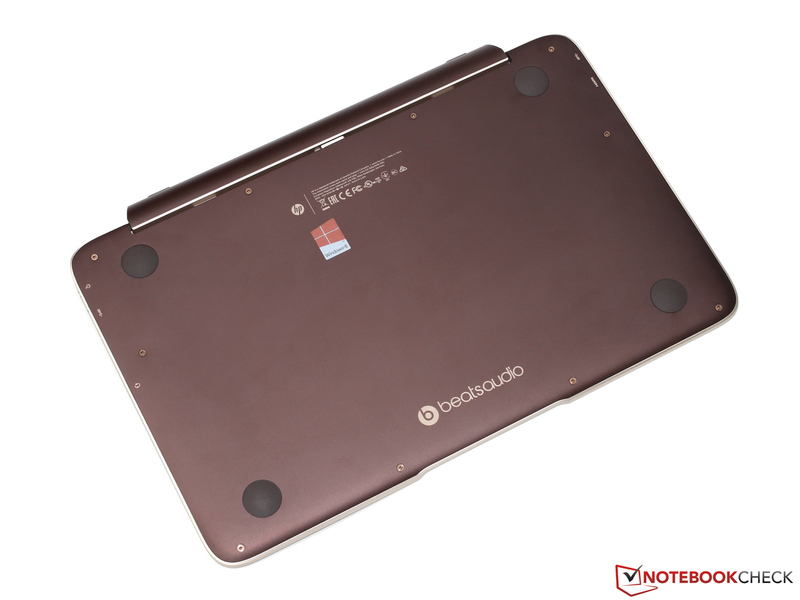 Similar concepts of hybrid notebooks are also offered by the competition: Samsung's ATIV Smart PC Pro, Acer's Iconia Tab W700 and Asus' Transformer Book TX300CA have been available for some time now, but all three devices require active cooling. 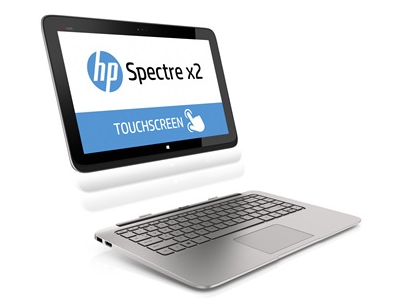 Can the Spectre 13 play its trump card? 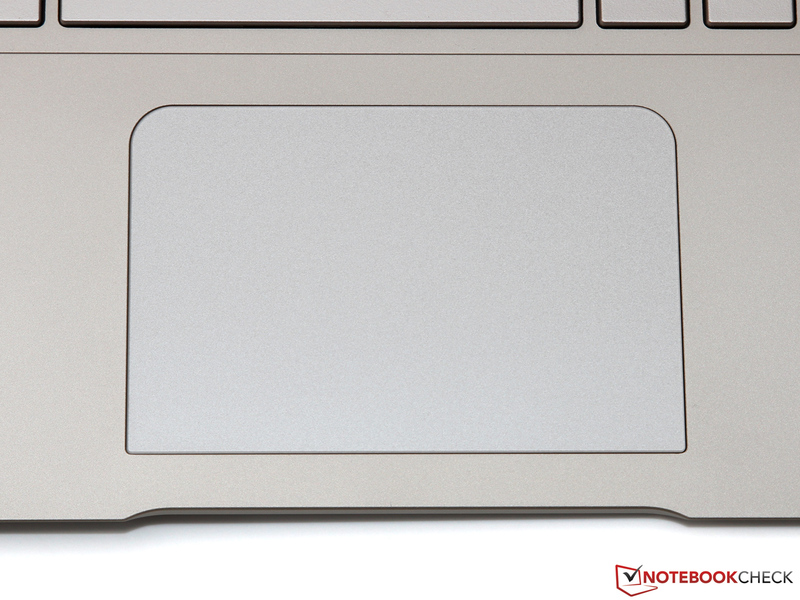 Our review unit has a nice aluminum case that reminds us of its smaller sibling Envy x2 with its rounded design. 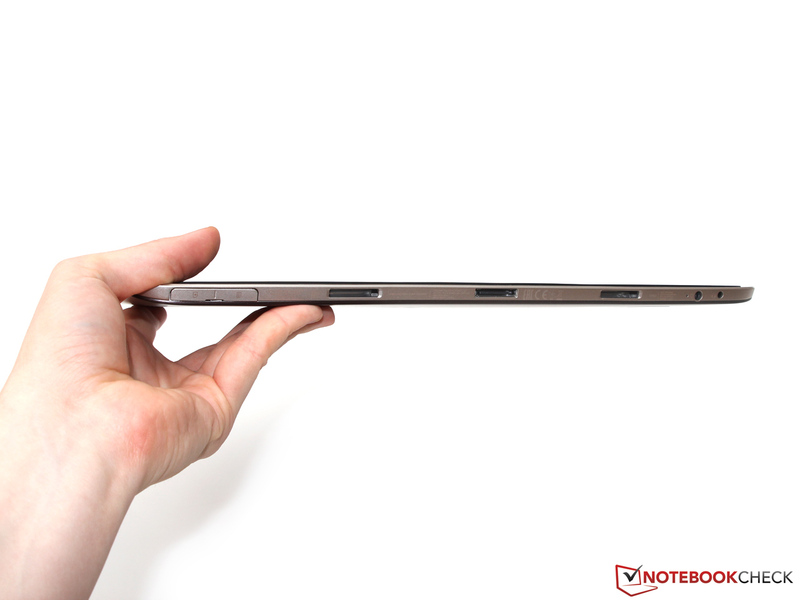 Even though it looks very thin and compact at first, the Spectre is noticeably bigger and heavier than a comparable ultrabook: Width and depth, but also the very high overall weight of almost 2 kilograms, are far above the class average. 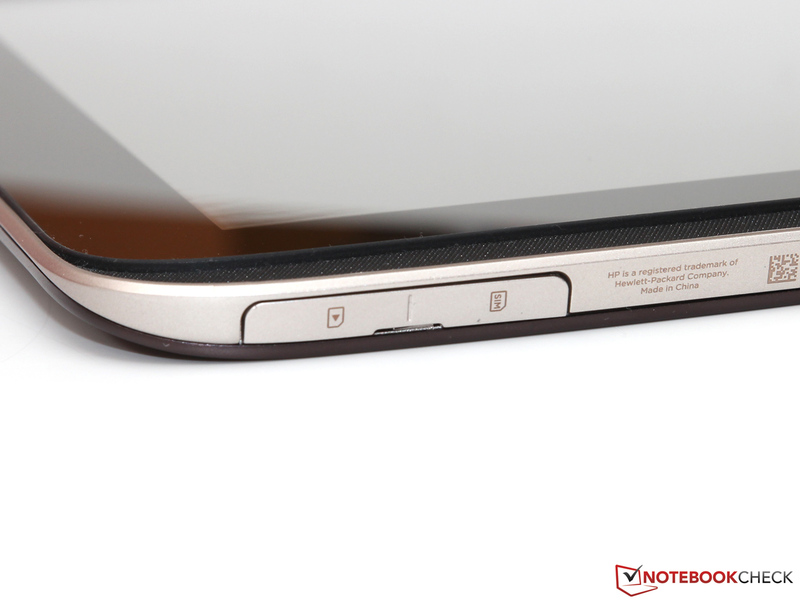 The weight distribution is quite even with around 990 grams for the tablet and the dock each. It is much more tiring to hold compared to the significantly lighter iPad Air (469 grams) - but this is the price for additional screen size and performance. 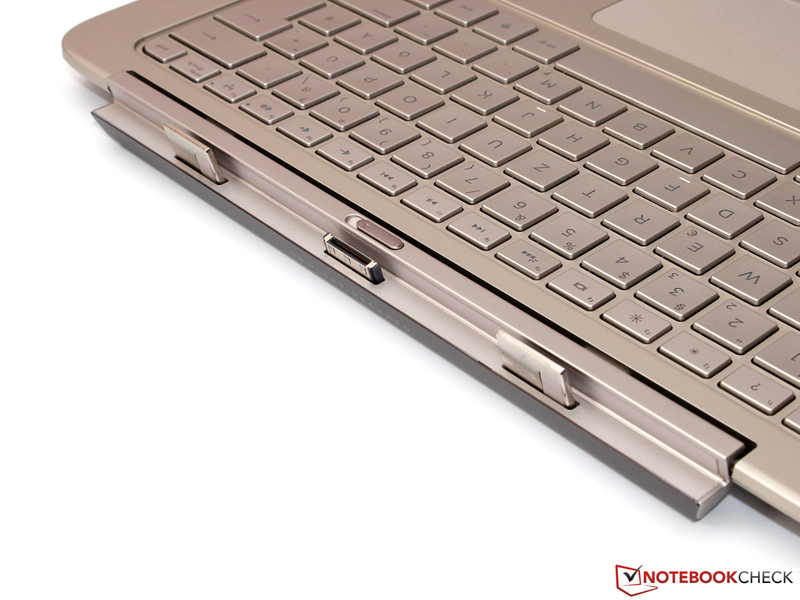 The massive construction of the notebook also results in an excellent stability. Concentrated force has no effect at all and you can only slightly twist the device if you try really hard. This is combined with an almost flawless build quality, we just cannot find any issues. Carefully deburred edges and precise material transitions are a sign of a good quality control from the manufacturer. Finally we want to mention the often somewhat troublesome connection between the base unit and the display. Unfortunately, the display tends to wobble quite a lot, which does not improve the handling of the touchscreen when you use the Spectre 13 as a notebook. You will have to push a button and pull the display upwards at the same time to detach the tablet from the keyboard dock. Connecting both parts is, however, really simple: Attach, lock, done. 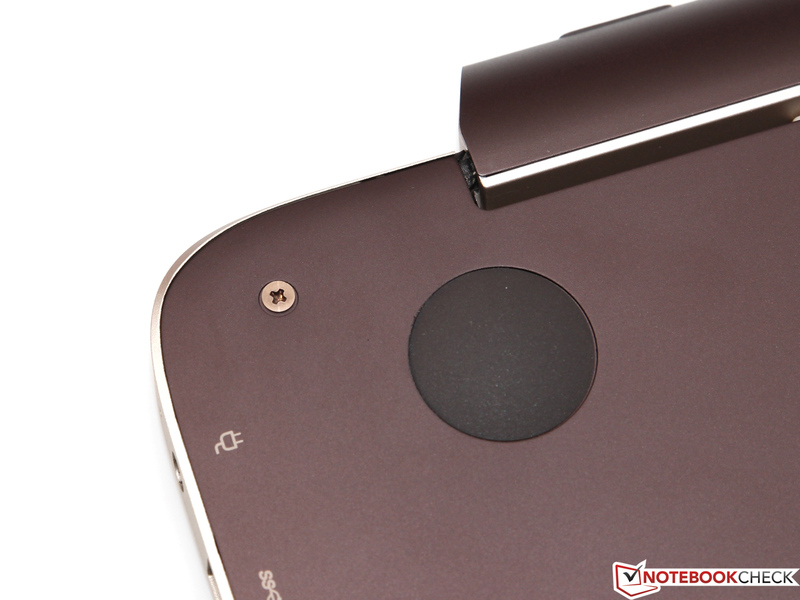 The tablet itself only has a headset port as well as a small cover for the micro SD card reader and the SIM card tray. 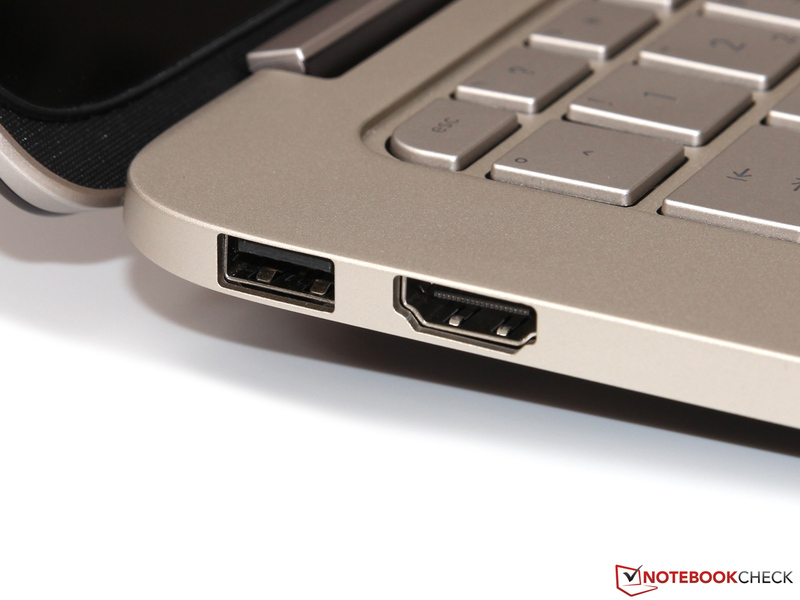 All the ports can only be accessed when you use the tablet because they are faced toward the display hinge. 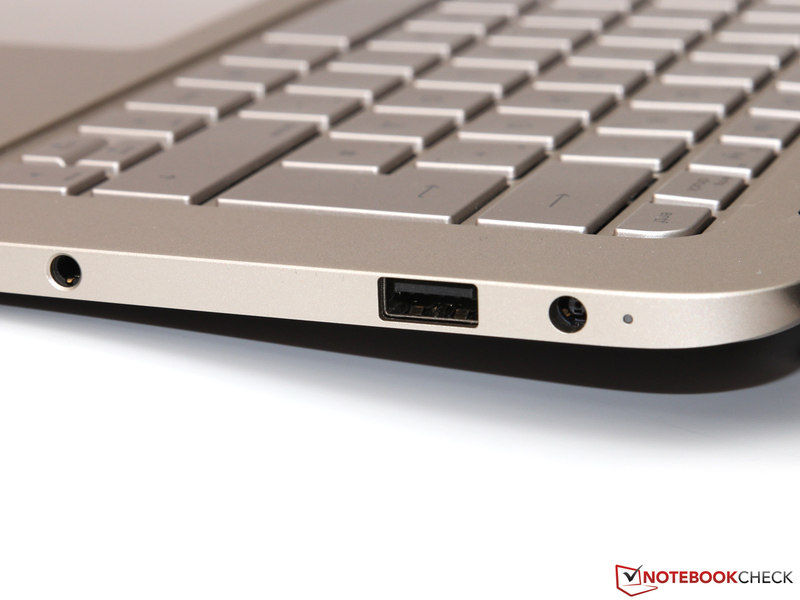 The keyboard dock has two USB 3.0 ports, one on the right side and one on the left side of the case. Besides another stereo jack and the HDMI port, these are the only ports of the Spectre. That should usually be sufficient for a mobile companion or a secondary device - you just might have to buy an additional USB hub or an according adaptor (e.g. USB-LAN) if required. Contrary to the limited port selection, the wireless connectivity of the Spectre does not leave much to be desired. 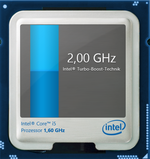 Intel's Wireless-AC 7260 not only supports Bluetooth 4.0 but also the WLAN standards 802.11 a/b/g/n/ac. The multi-band (2.4 and 5 GHz) and multi-stream (2x2) adaptor manages transfer rates of up to 867 Mbps if you have an according access point. Range, signal strength and transfer rate were also very good in our test with an 802.11 n router. 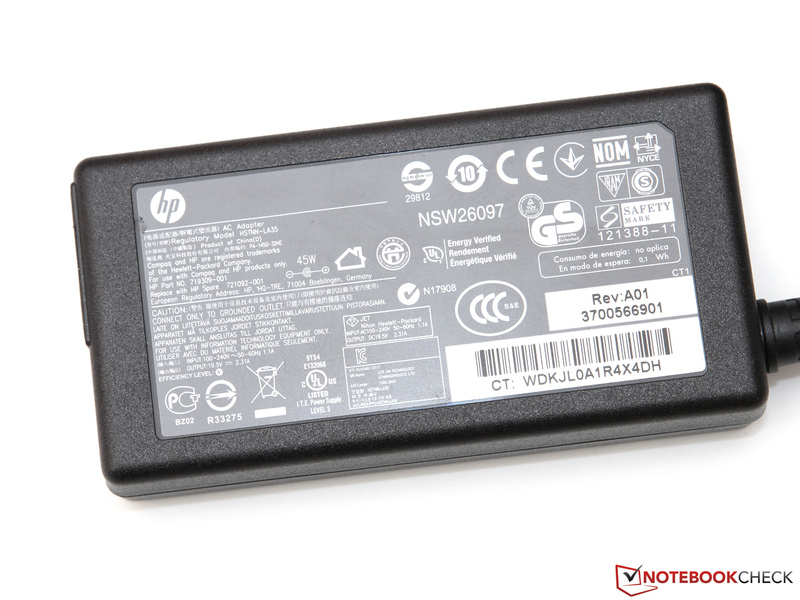 HP also integrated an additional WWAN module for internet on the go. The module supports UMTS as well as HSPA, but not the faster LTE technology. The high resolution 2.0 megapixel webcam is superior to many competitors, which are usually equipped with a 0.9 MP sensor. However, this theoretical advantage does not result in better pictures: We could not really see a difference between the 720p and 1080p setting. Both lacked details and there was significant noise in darker environments. The camera is surrounded by the according array microphone that has an excellent voice quality; it can easily replace an external headset. 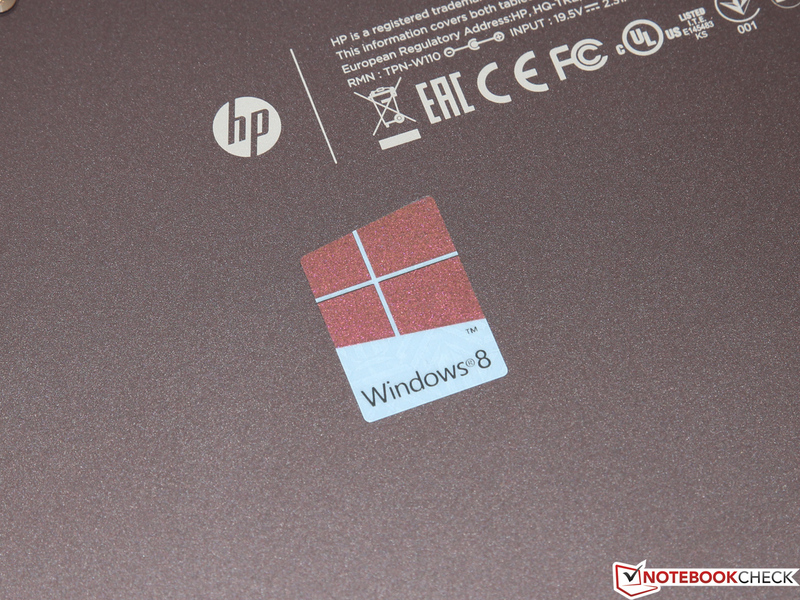 HP's hybrid is one of the first devices that use Windows 8.1 (64-bit) ex-works. We do not want to talk about the mostly minor improvements of the new operating system. 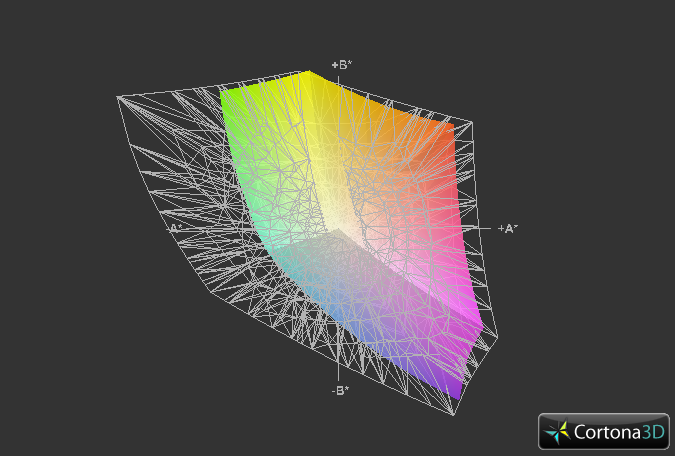 Instead we want to mention the optimized compatibility with higher resolution displays and the improved operation. Besides some system tools, which can be accessed via the HP Utility Center, the manufacturer also preinstalled a virus scanner (McAfee Internet Security, trial version) as well as Adobe Photoshop Lightroom 5 - a powerful image editing tool that retails for around 100 Euros (~$135). There are no physical accessories in the simple box. You only get the tablet, the keyboard dock, some brochures and the according 45 Watts PSU. The bottom cover of the keyboard dock is secured by screws. 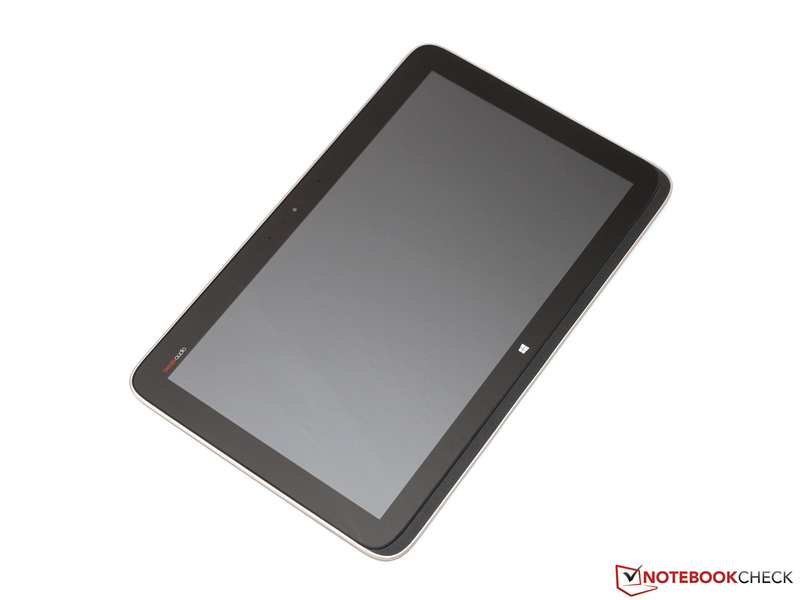 Typically for a tablet, the maintainability is very limited - or more precisely: There is none. 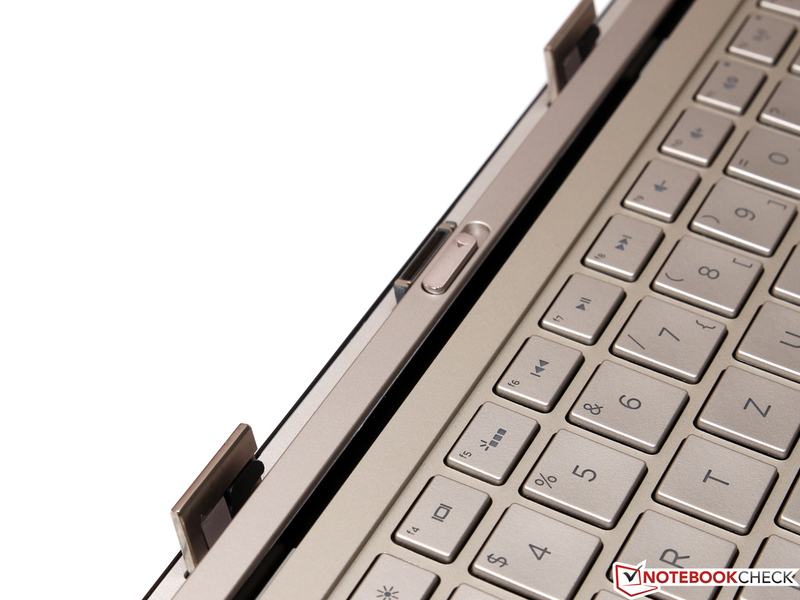 We can only find some screws on the bottom of the keyboard dock, which does not contain any relevant components apart from the additional battery. Memory, SSD and processor are in the tablet unit and cannot be replaced. The warranty period can differ depending on the country. Users in the United States will get a limited 12-month hardware warranty as standard. 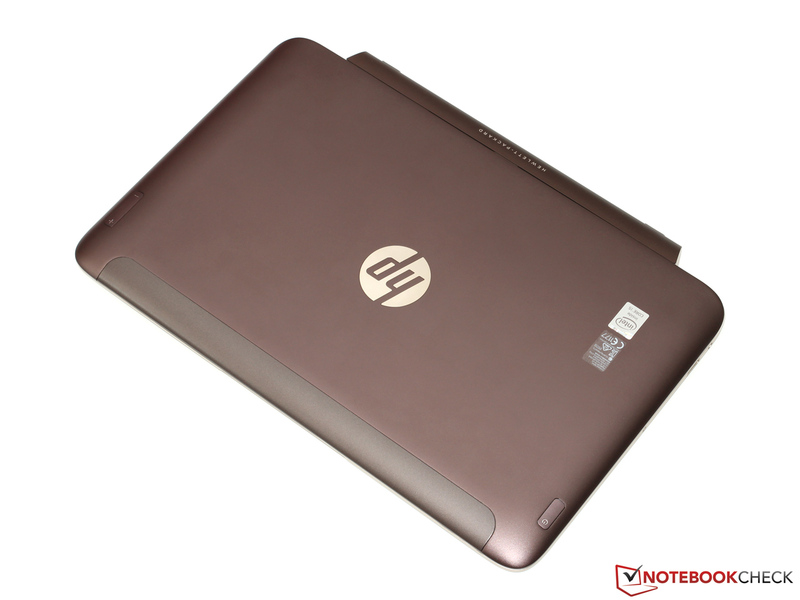 As usual with HP, you can extend the warranty with different Care Packs. An upgrade to three years including accidental damage protection, for instance, is currently available for $229. 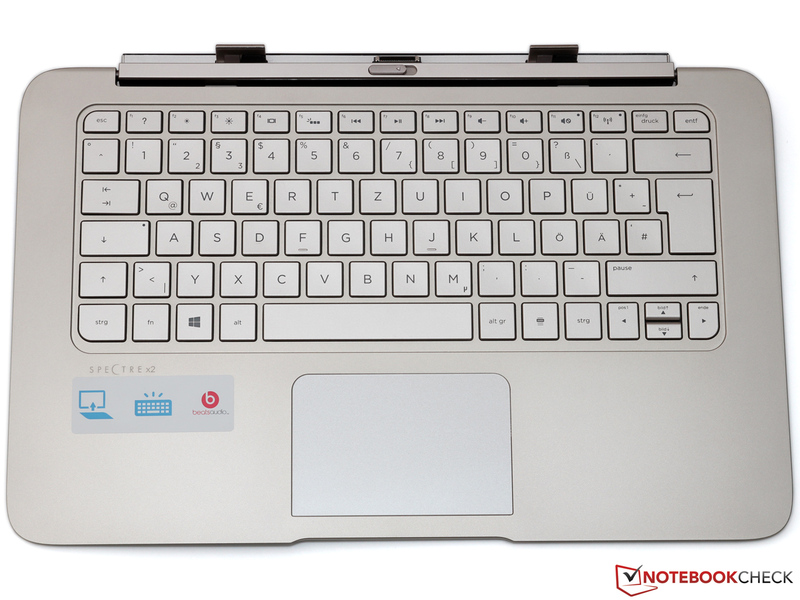 The backlit chiclet keyboard is seamlessly integrated into the dock, which is made of solid aluminum. 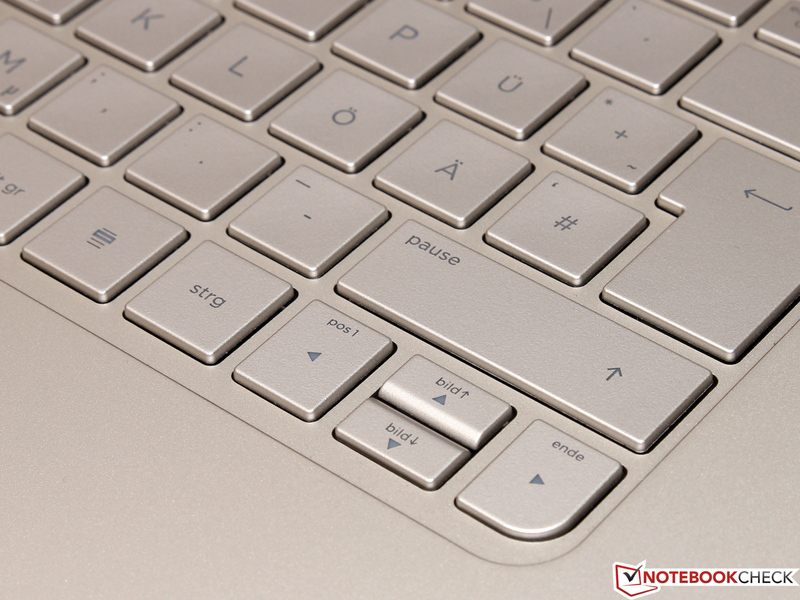 The key size is generous with 15 x 15 millimeters and both the layout and shape of the keys meet the usual standards with some small exceptions (arrow keys). 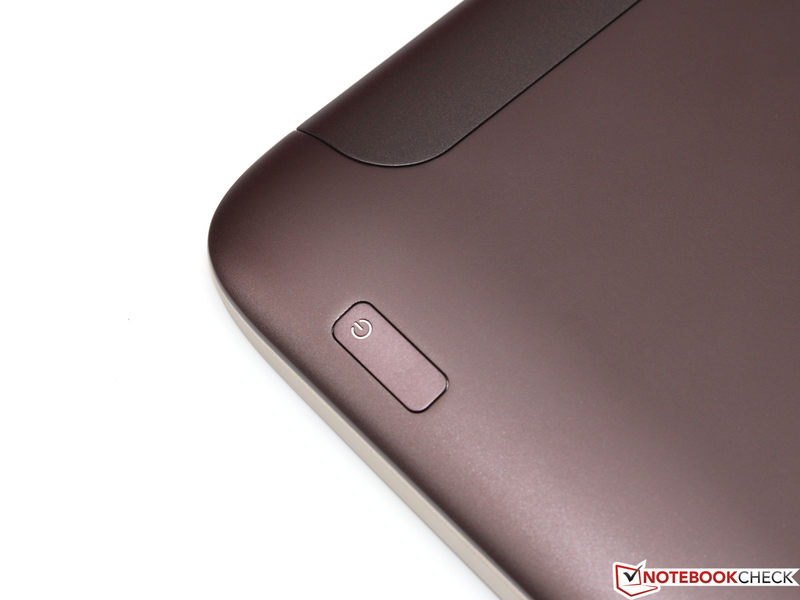 Only the volume rocker and the power button at the back of the tablet are a bit unusual. The F-keys can only be used via Fn-key ex-works, but that can be changed in the BIOS settings. The formerly mentioned bulky construction does have its advantage: Even intense typing does not lead to annoying flexing of the keyboard. In combination with the well-defined and solid stroke, we are faced with a convenient typing experience and a lot of feedback - even longer typing sessions are no problem. The resulting noise is unobtrusive at the same time. 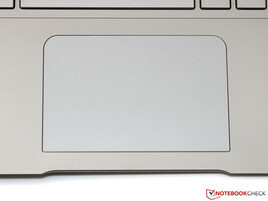 The large touchpad (9.5 x 6.2 centimeters) is provided by the touchpad specialists from Synaptics. The very smooth and glass-like surface enables a very sensitive and precise control, but does show a rather high frictional resistance with sweaty fingers. All supported multitouch gestures are well explained in the driver with small animations and can be activated and deactivated individually. Being a so called clickpad, we do not get dedicated mouse buttons. 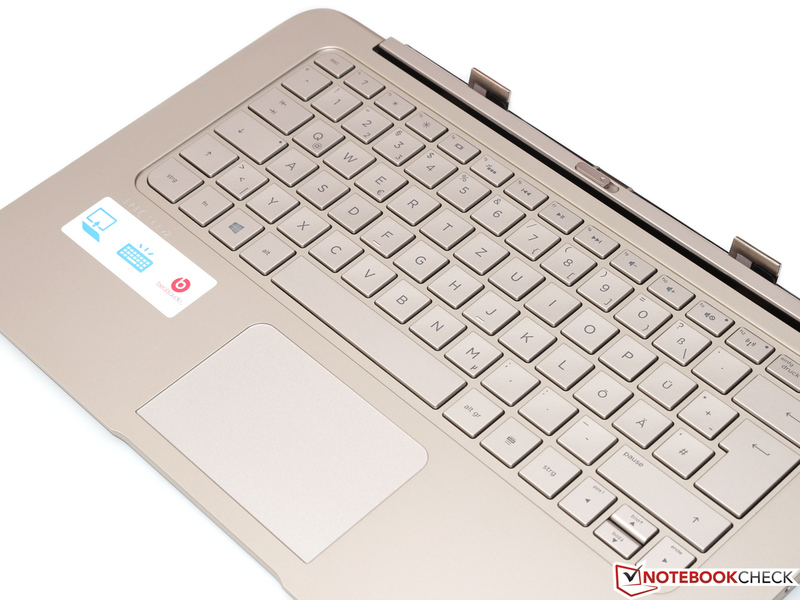 Instead they are activated with a click on the according lower half of the touchpad surface. That works quite well in practice, but we do not like the somewhat wobbly and very sluggish pressure point - we already saw better solutions from other manufacturers. 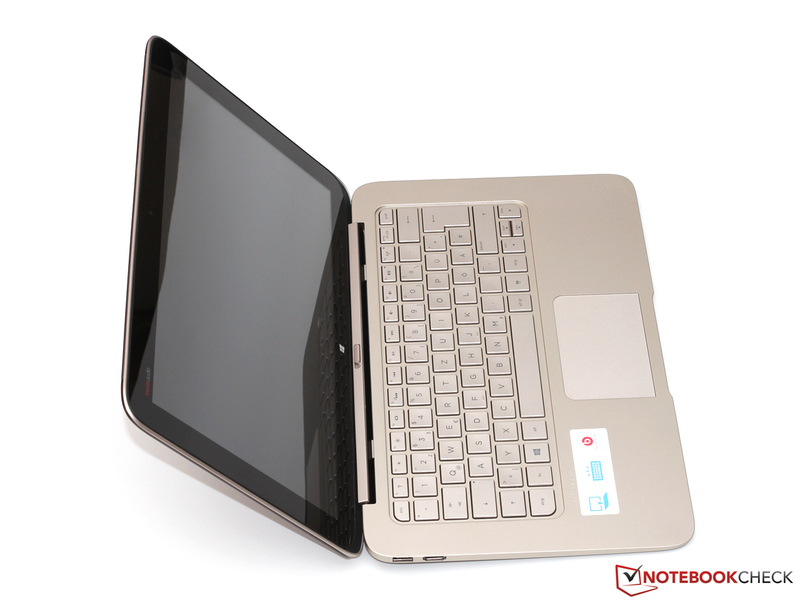 While the touchscreen is nothing more than a nice addition for the notebook, it is crucial when you only use the tablet. Up to ten fingers can be recognized simultaneously; the execution is very accurate and without delays. This especially improves the handling of the new Metro-UI. The size of the Spectre is, however, unusually big, at least for a tablet. The benefit is more screen estate, which surpasses a current iPad by around two-thirds, but there is also the obvious problem of the higher weight. Even though there are already significantly higher resolution displays in the 13.3-inch range, we completely understand HP's decision to use a Full HD panel: Single pixels are barely visible with a pixel density of 166 ppi, so the additional charge for an even better panel would not make a whole lot of sense. There is also still the problem that many older applications do not work very well with these high pixel densities. The Spectre manages a good maximum display brightness of around 335 cd/m², but some ARM based rivals are even better (iPad Air: 442 cd/m²). The integrated brightness sensor could be improved as well; the selected brightness is usually too low in many situations. Luckily you can also deactivate this feature in the energy settings. The IPS panel from AUO not only provides a good resolution and brightness, but also an excellent picture quality. Thanks to the rich black value of just 0.3 cd/m² we get a contrast ratio of 1,145:1 - an impressive result that is only surpassed by a few tablets or notebooks. The subjective picture quality is also excellent and especially improves multimedia applications and games. 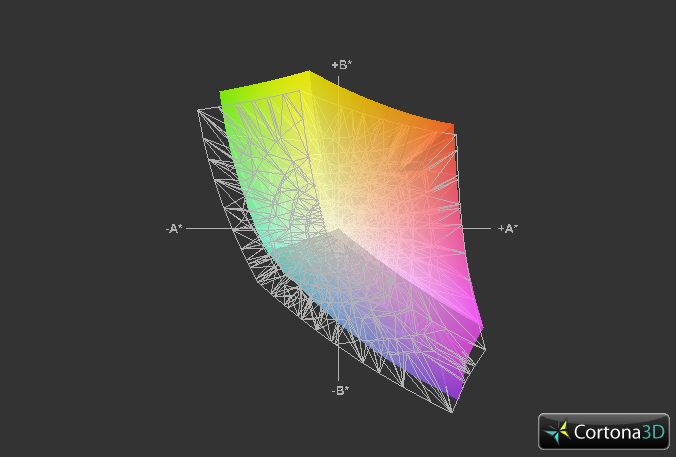 HP's tablet surprises us with good color accuracy for a consumer device, which is even sufficient for many graphics applications without additional calibration. The characteristic DeltaE deviation is so low for most colors and the grayscale presentation that the untrained eye will not see a difference between the real colors and the displayed colors. 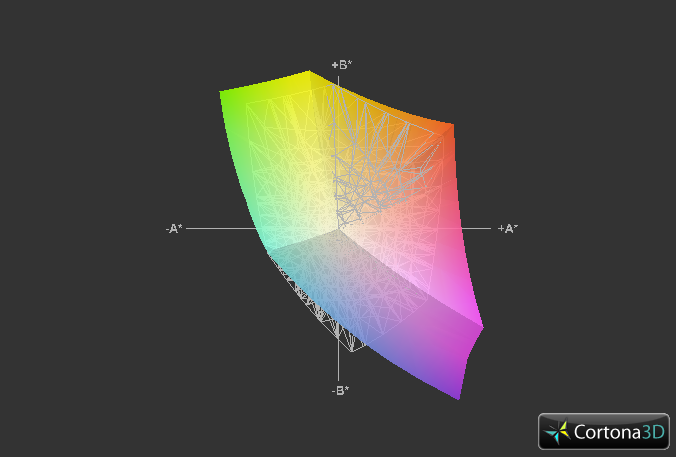 Even though the important sRGB color space is not completely covered, the overall performance is convincing. 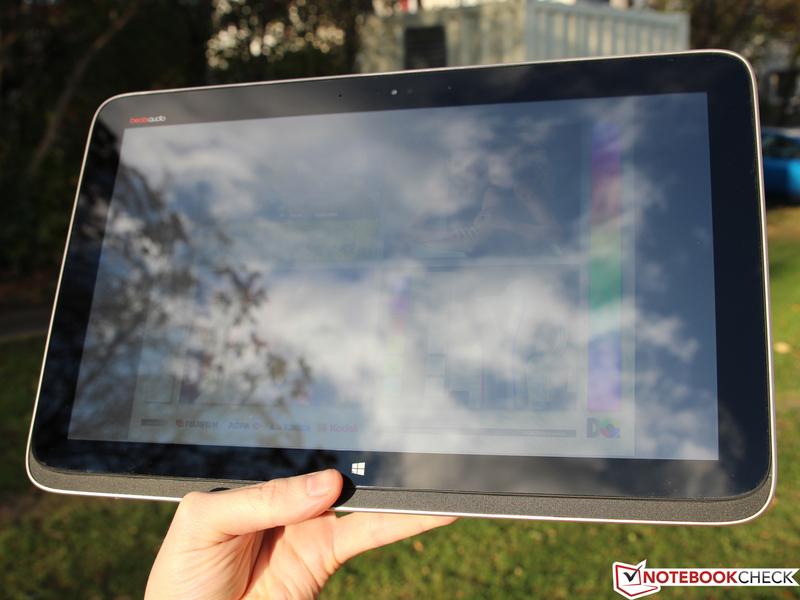 Annoying reflections are unfortunately a constant issue outdoors because of the glossy display surface. The backlight is at least powerful enough to ensure the visibility of the display content when you avoid direct sunlight - however, this does affect the battery runtime since the maximum brightness will obviously consume more energy. But the same applies for the competition; matte touchscreens that could solve the problem can only be found in business devices and are usually not that great with finger inputs. 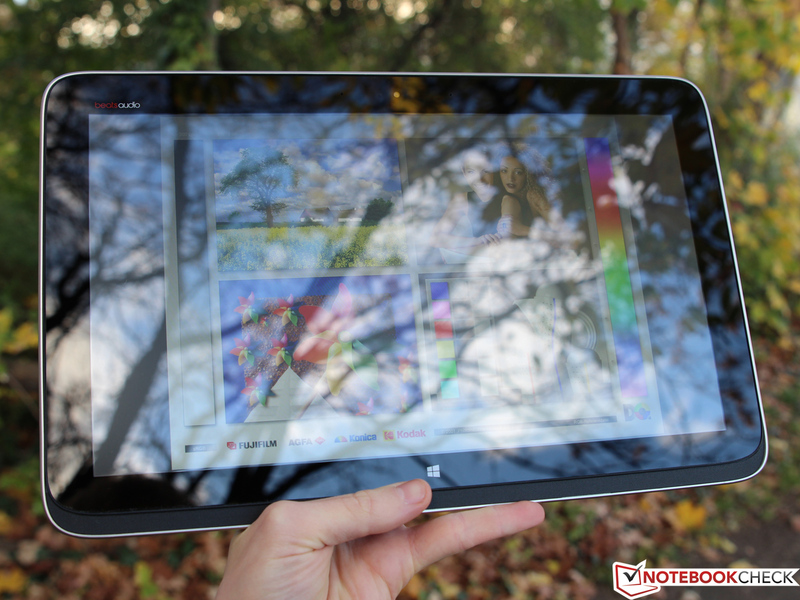 You can use the tablet both in portrait or landscape mode, so good viewing angle stability is even more important than with a notebook. Most manufacturers know that, so most of the devices - apart from some low-end devices - are equipped with an IPS display. It does not matter how we use our review unit: Except for a slight brightness reduction, the picture does not change even with extreme viewing angles. 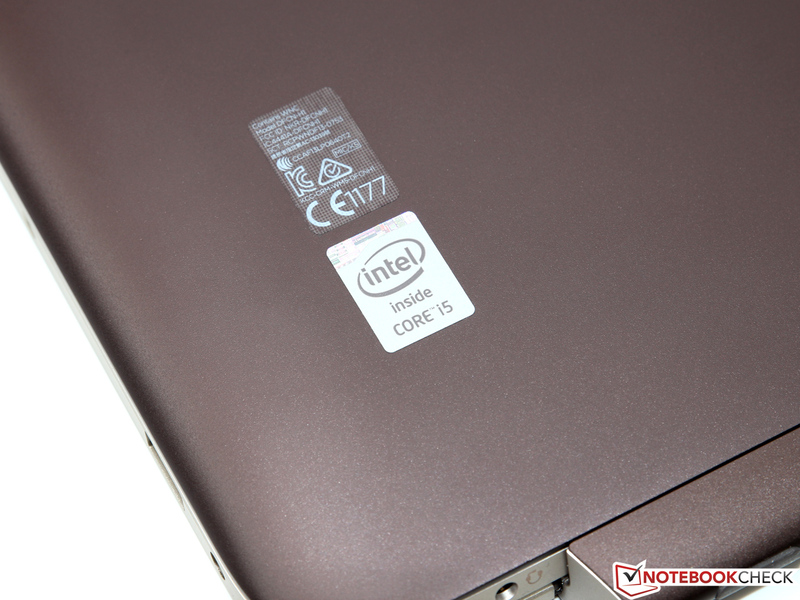 Besides the common ULV CPUs with a TDP of 15 Watts, for example the popular Core i5-4200U, Intel has also offered the more frugal Y-series for some time now. These processors are specified with a TDP of just 11.5 Watts and therefore perfect for very thin devices without complex cooling solutions. 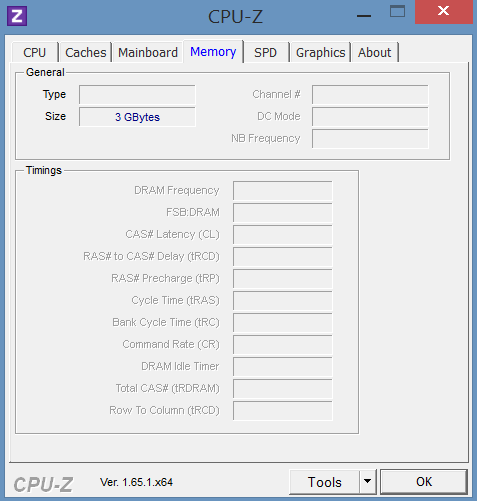 We can even see a consumption of just 4.5 Watts in practice and without maximum load for the Core i5-4202Y. According to the manufacturer, this is the so called SDP (Scenario Design Power), which is more or less a marketing slogan without an accurate comparability. This is also the reason why we prefer the usual TDP rating. The mentioned efficiency improvement is traded for a significantly reduced Turbo Boost: While the Core i5-4200U runs with 1.6 up to 2.6 GHz, the 4202Y is limited to 1.6 - 2.0 GHz. 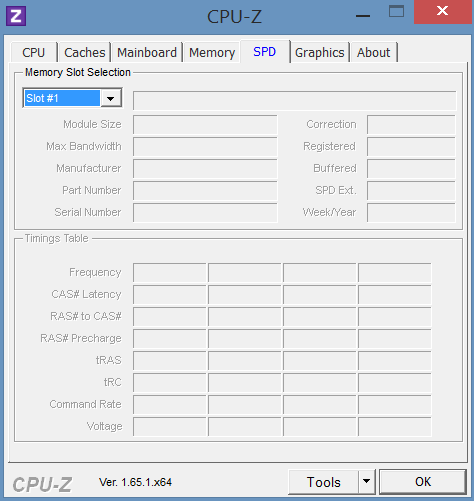 Apart from that both processors are very similar and support the same features like Hyper Threading, AES-NI or AVX2. 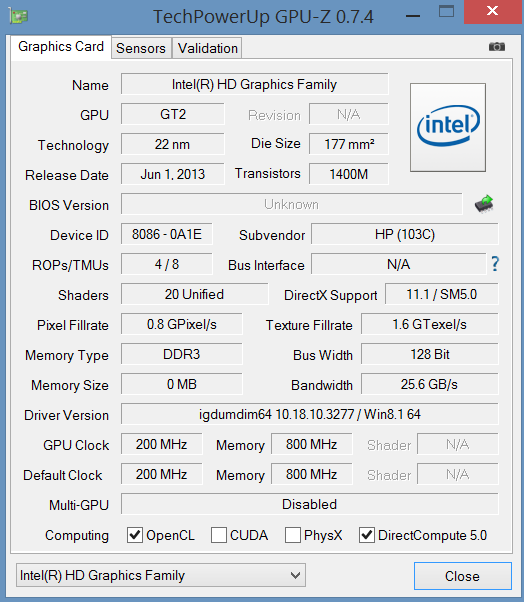 The comparatively low clock of the integrated graphics card is another tribute to the lower energy consumption. With 200 up to 850 MHz, the HD Graphics 4200 is slightly below the HD Graphics 4400 that is also equipped with 20 Execution Units (EUs). It will be interesting to see the performance gap in practice, where the maximum turbo frequency is not very common. Generous for a tablet but only average compared to current ultrabooks is the memory and storage equipment with 4 GB RAM and a 128 GB SSD. The memory is clocked at 800 MHz and works in a dual-channel configuration to enable the highest performance possible. 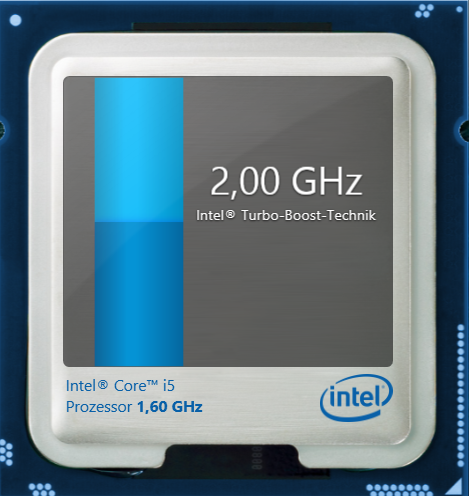 TDP or not, we had our doubts whether the Core i5-4202Y was able to maintain its maximum Turbo Boost. These doubts were luckily unfounded. 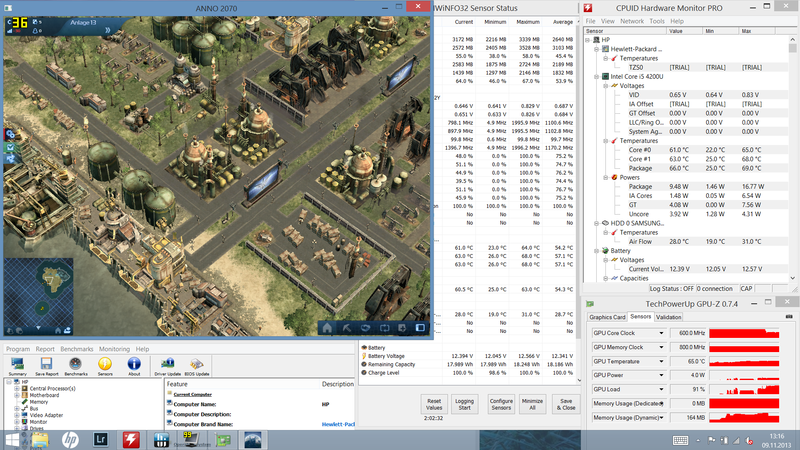 The CPU manages a steady clock of 1.7 GHz in multi-thread scenarios and the full 2.0 GHz when we only stress one core. Even a repeated benchmark run does not change this situation. 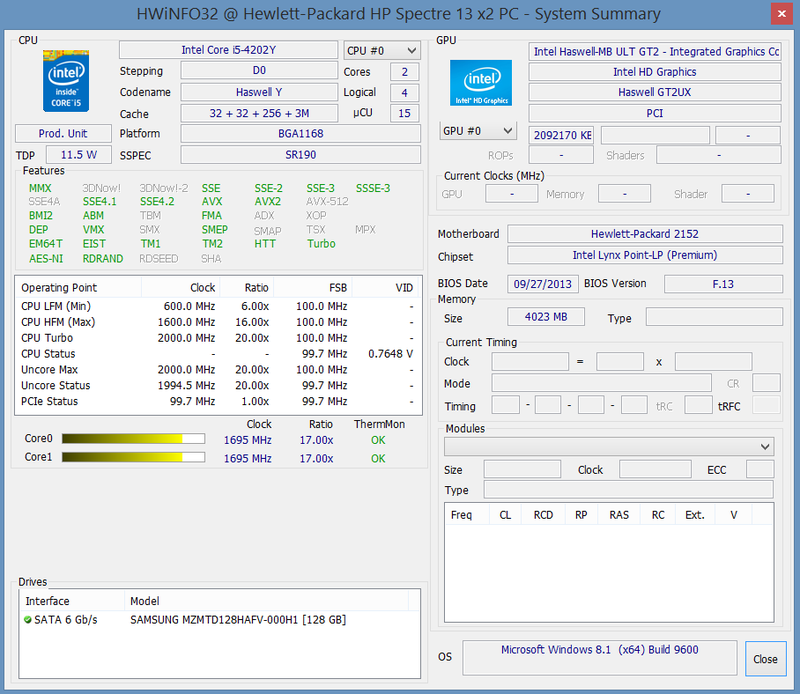 In accordance with the mentioned clocks, the processor is roughly on a level with a Core i3-4100U (15 Watts, 1.8 GHz). The comparison with some older mainstream CPUs is especially surprising: The Core i3-350M, which was introduced in early 2010, had a specified TDP of 35 Watts (three times higher) at a similar performance. The consumption deficit compared to the fastest ARM SoCs, especially the rather energy-hungry Tegra 4 from Nvidia, should not be that big anymore. 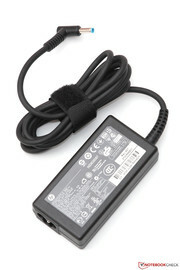 HP could not integrate a common 2.5-inch drive due to the limited space, but used a compact mSATA SSD instead. 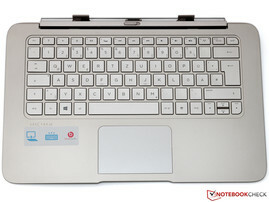 More precisely the Samsung PM841, a familiar drive found in several other reviews. Besides their high reliability, Samsung SSDs are also known for their excellent performance. Especially the sequential transfer rate (read) of more than 500 MB/s is impressive, while the write performance of only 130 MB/s is just mediocre. The latter is the result of the small capacity of 128 GB - a 256 GB would get higher results. However, more important in practice is the performance with small 4 K blocks and the PM841 can completely convince us in this regard. 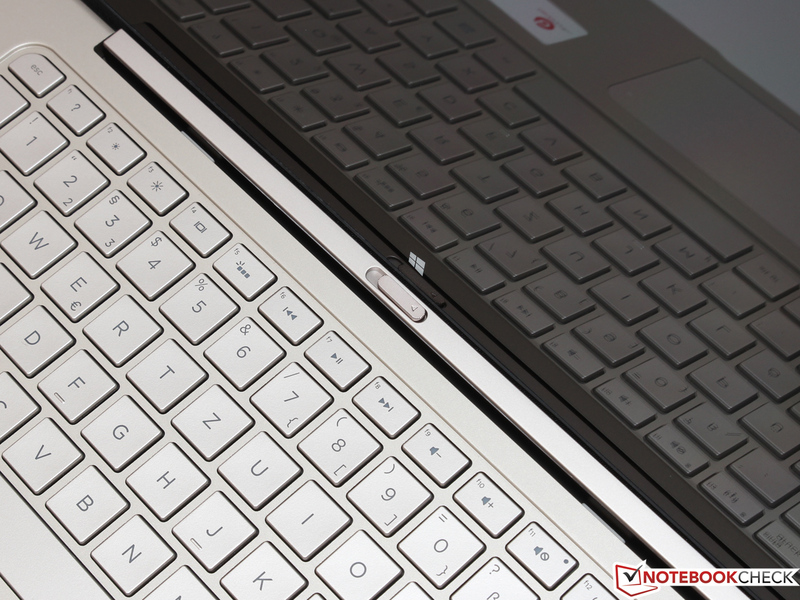 Regardless of the slightly lower CPU performance, the Spectre x2 is on a level with its competitors in PCMark 7. 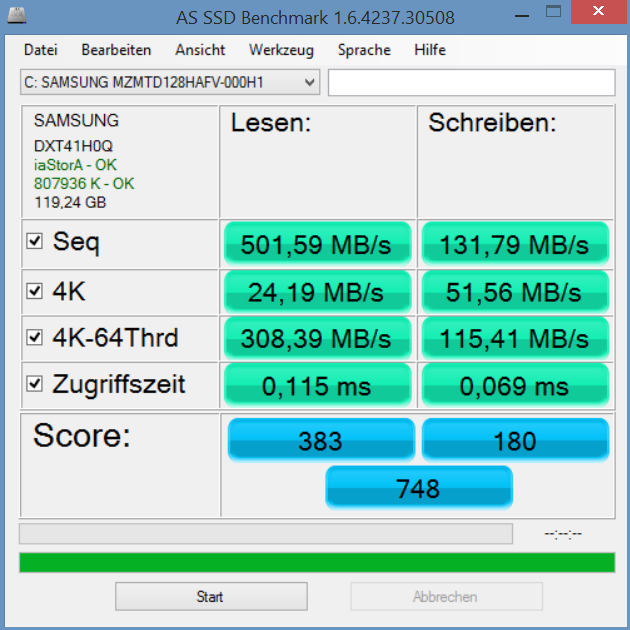 The benchmarks of the PCMark series mainly evaluate the storage performance besides the CPU, so our review unit benefits from the fast Samsung SSD. The subjective impression is also dominated by the SSD with short loading times and a very responsive system - users should not notice any differences to a more powerful device in many situations. You will only see the limitations of the ULV hardware in very demanding scenarios. The only difference between the HD Graphics 4200 and the HD 4400 or HD 4600 on paper is the lower clock. This obviously affects the performance as well: Sony's Vaio Duo 13 with the more powerful Core i5-4200U has a significant advantage of 33% in 3DMark 11; the lead of a dedicated low-end GPU like the GeForce 710M is even bigger. 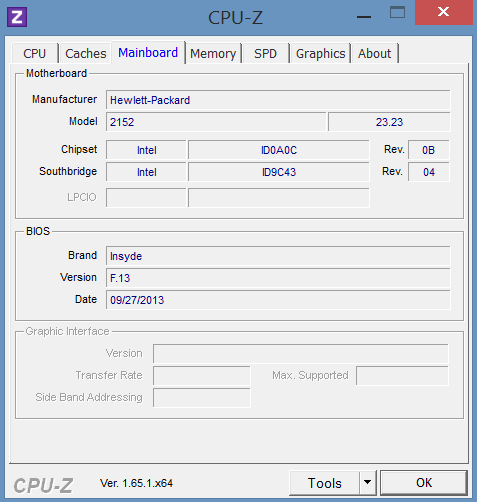 The HD 4200 does at least beat the older HD 4000, which can be found in processors based on the older Ivy Bridge architecture, in this benchmark. The HD Graphics 4200 is not really powerful enough for smooth frame rates in current games. 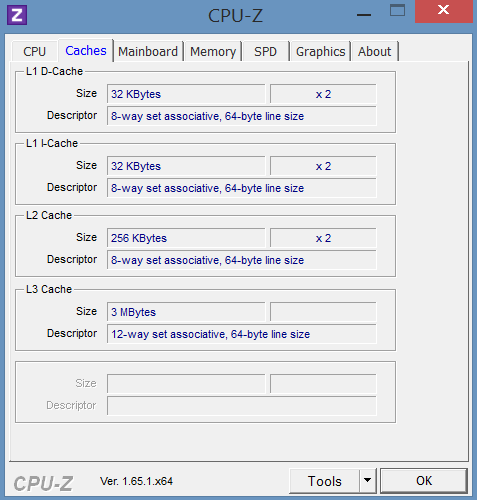 Simultaneous load for the processor and the graphics card shows the limit of the low TDP; both components only run with reduced clocks. The CPU clock was usually identical with the idle clock during our measurements, while the GPU leveled off at around 600 MHz. Depending on the title, these clocks are steady for around 10 minutes. After that the GPU clock drops even further and will eventually level off at 350 MHz. The performance is therefore comparable to the HD Graphics (Ivy Bridge) – which is rather disappointing and a surprisingly big gap to the HD Graphics 4400 of the 15 Watts CPUs, which is more than twice as fast in some cases. Passive cooling and a Solid State Drive result in a completely silent operation - regardless of the load. Fortunately, we cannot determine any annoying noises from the PSU either. No fan = high temperature? Not at all: The temperatures at the front and at the back do not cause any criticism. We cannot measure temperatures above 30 °C during idle or with light workloads like simple multimedia tasks, which is a sign of an excellent energy management. The results under maximum load are almost even more impressive. 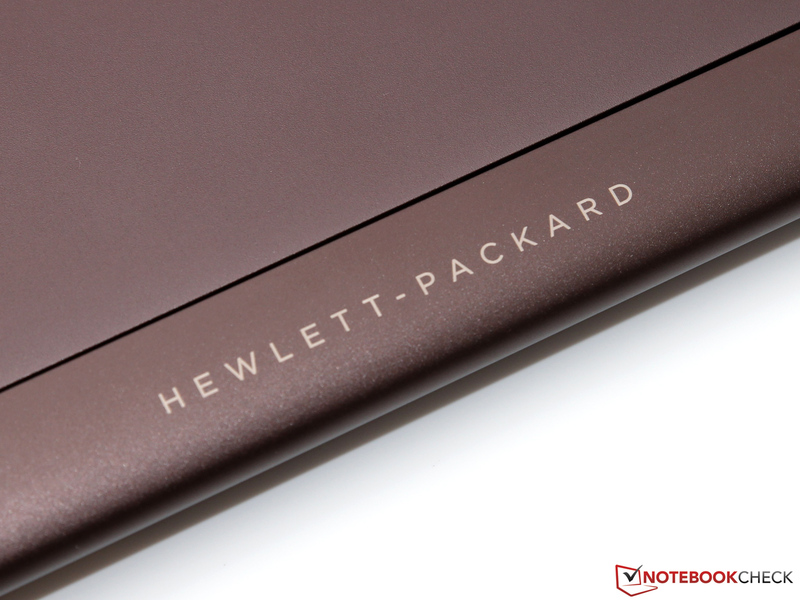 HP managed to use the whole case surface to dissipate the heat - and avoid any inconvenient hot spots. Handling the device with two hands is no problem. However, you should consider one thing: In deference to the temperature development, the manufacturer cuts the performance of the Core i5 in half. Even though the CPU could consume up to 11.5 Watts there seems to be an artificial barrier at around 9.5 Watts, and the consumption even drops to 7 Watts after a couple of minutes (see Gaming Performance). The processor hardly surpasses 60 °C as a result, but the clocks are also very low (CPU: 800 MHz, GPU 250 MHz). (±) The average temperature for the upper side under maximal load is 34.6 °C / 94 F, compared to the average of 30.3 °C / 87 F for the devices in the class Convertible. (±) The maximum temperature on the upper side is 40.6 °C / 105 F, compared to the average of 35.4 °C / 96 F, ranging from 21.8 to 55.7 °C for the class Convertible. (+) In idle usage, the average temperature for the upper side is 28.1 °C / 83 F, compared to the device average of 30.3 °C / 87 F.
(-) The average temperature of the palmrest area of similar devices was 29 °C / 84.2 F (-6.8 °C / -12.2 F). The stereo speakers, which are advertised with the Beats Audio logo, sit beneath the display and are faced towards the user. Compared to other tablets we would describe the sound as rich and sufficiently loud, but there could be more bass for our taste. 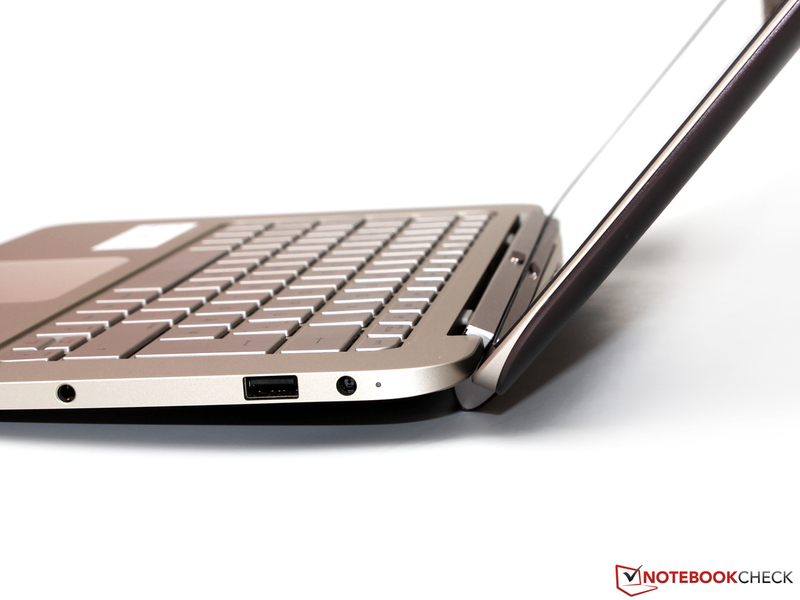 Many big multimedia notebooks, obviously with more space for larger speakers, produce a more powerful sound experience. As usual, we recommend external speakers, which can be used via HDMI or stereo jack, for a better sound. 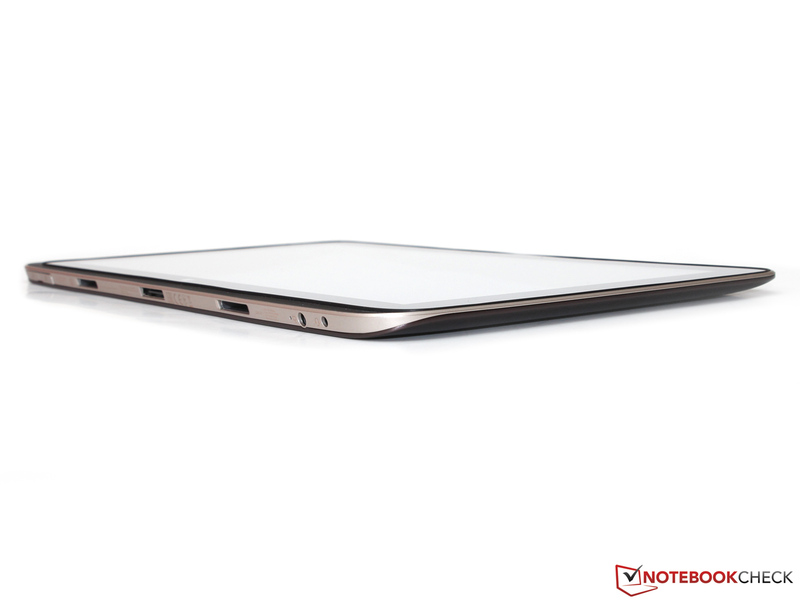 The Spectre x2 is one of the most frugal Windows devices with an idle consumption of only 4.8 - 7.1 Watts. However, the MacBook Air 11 (1.5 up to 4.7 Watts), for instance, shows that the Haswell platform can even consume less energy. Even though Microsoft did improve the energy-saving features of Windows - Apple's Mac OS X is still in its own league. We can really see the strength of the review unit in the second part of our test. 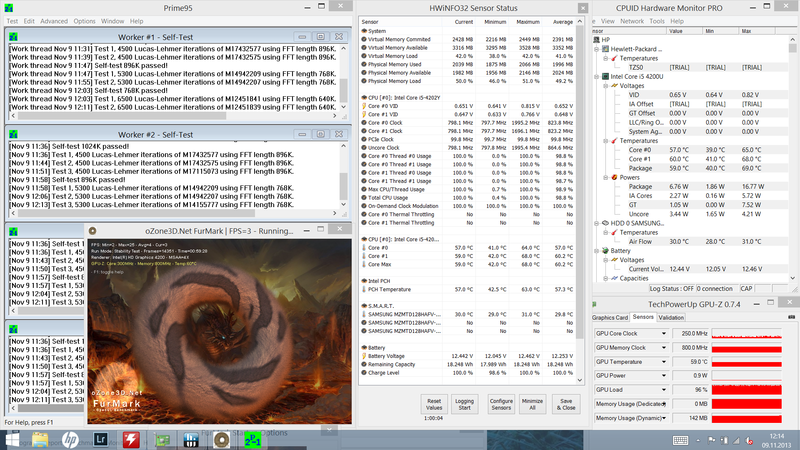 Only 16 Watts in 3DMark06 and - due to the throttling issues - only 14.5 Watts in our stress test. The comparison with the ARM rivals (iPad 4: up to 12.5 Watts, Excite Pro: up to 13.2 Watts) is especially interesting. The consumption advantage is not very big, despite the smaller displays and the lower performance. The provided 45 Watts PSU is therefore more than sufficient and only really stressed when you use the tablet and charge it at the same time. 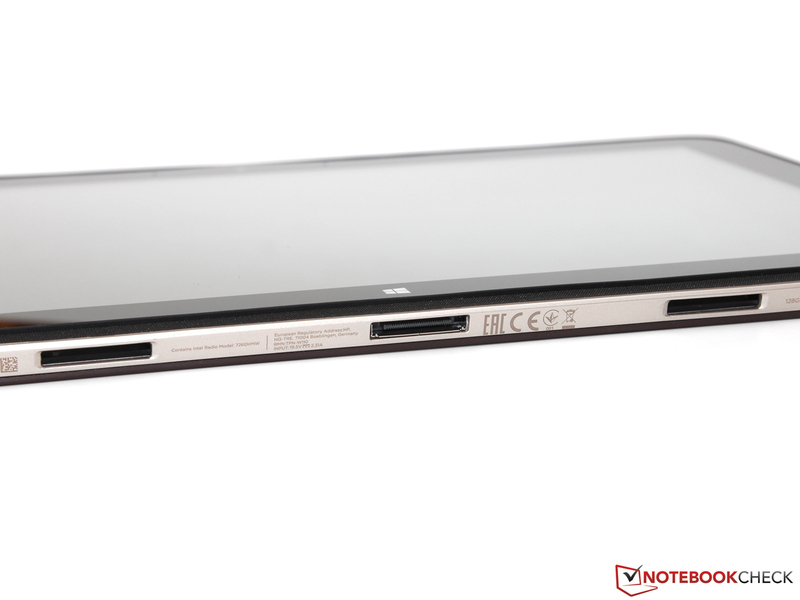 Besides the 32 Wh battery in the tablet there is an additional 18 Wh battery in the dock beneath the keyboard. The following runtimes will therefore be reduced to around 70% when you use the tablet without the dock. 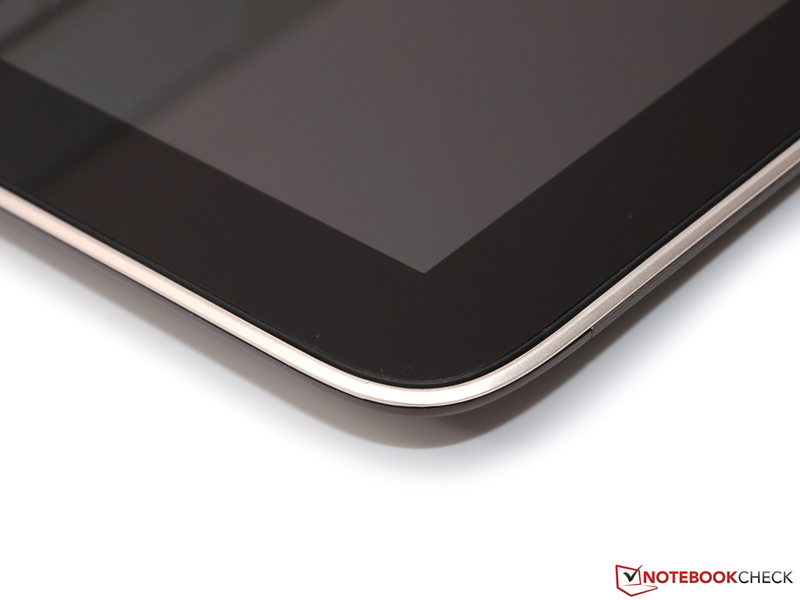 The tablet will always use the energy of the smaller additional battery first. In combination with the low but not record breaking minimum consumption, we determine a maximum runtime of 11 hours and 6 minutes. Even though the Battery Eater Reader's Test does not really stress the system (energy-saving mode, minimum display brightness, wireless modules deactivated), we cannot reach the advertised runtime of 12 hours. 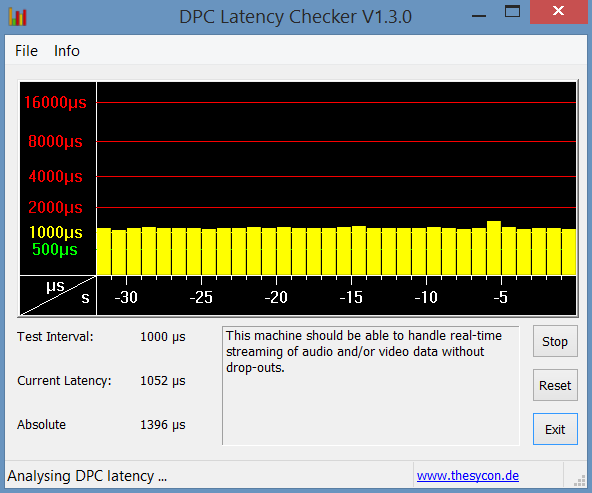 A more realistic scenario with activated WLAN and adjusted display brightness (around 150 cd/m²) results in a runtime of 7 hours and 25 minutes. This is enough to beat most of the direct rivals and to last a whole day without a recharge. However: Some ARM-based tablets (iPad 4: more than 9 hours) as well as some of the best ultrabooks (MacBook Air 13: more than 10 hours) manage even longer runtimes. HP does not further reduce the CPU and GPU performance on battery power, so the user can take advantage of the full performance on the road. 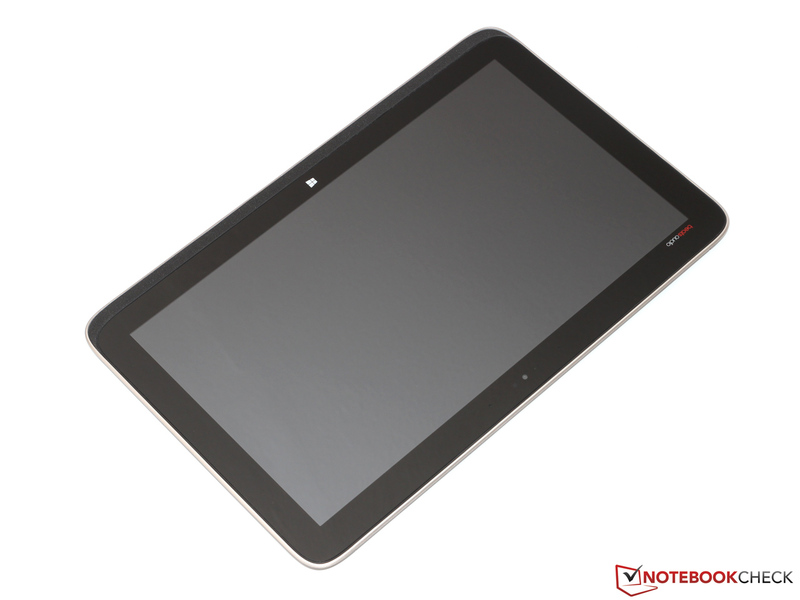 Since the Core i-4202Y does not have the highest clocks to begin with, the tablet manages a runtime of 2 hours and 45 minutes in the Battery Eater Classic Test (high-performance, maximum display brightness, wireless modules activated). A complete recharge does, however, take quite a while: The batteries reach their full capacity after around 4 hours. 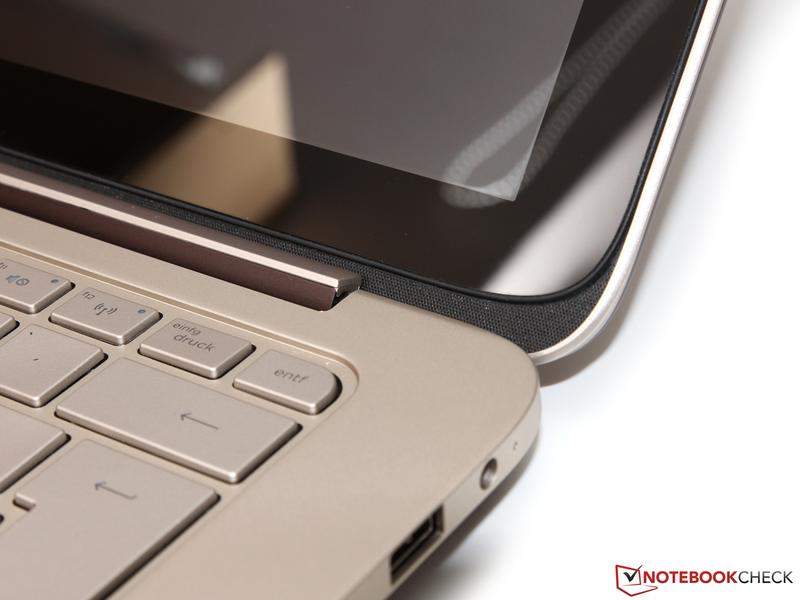 Tablet, (hybrid) notebook, convertible or detachable - the HP Spectre 13-h205eg x2 fits into many categories. Just as versatile as the names are the usage scenarios: A silent office worker or a multimedia gadget - almost everything is possible. 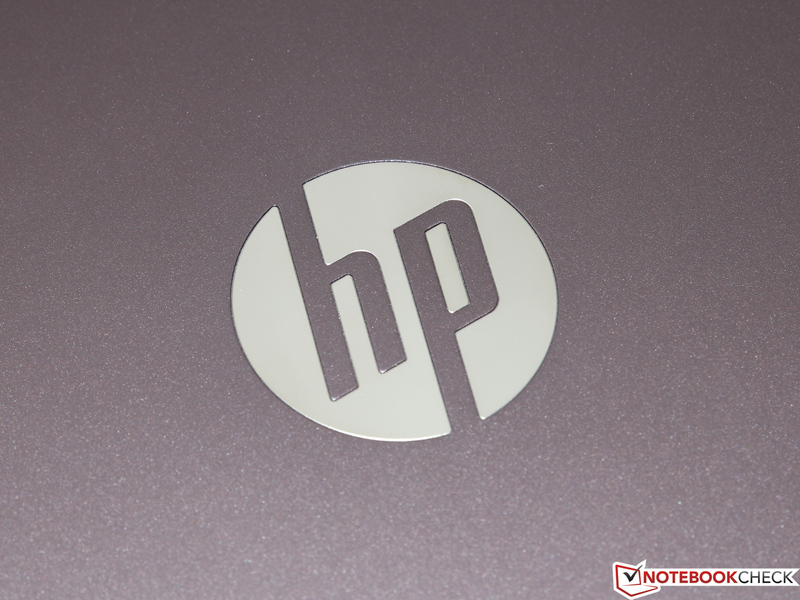 HP did a nice job in regard to the quality. This not only applies for the rigid but also slightly bulky aluminum chassis, but also for the integrated components. 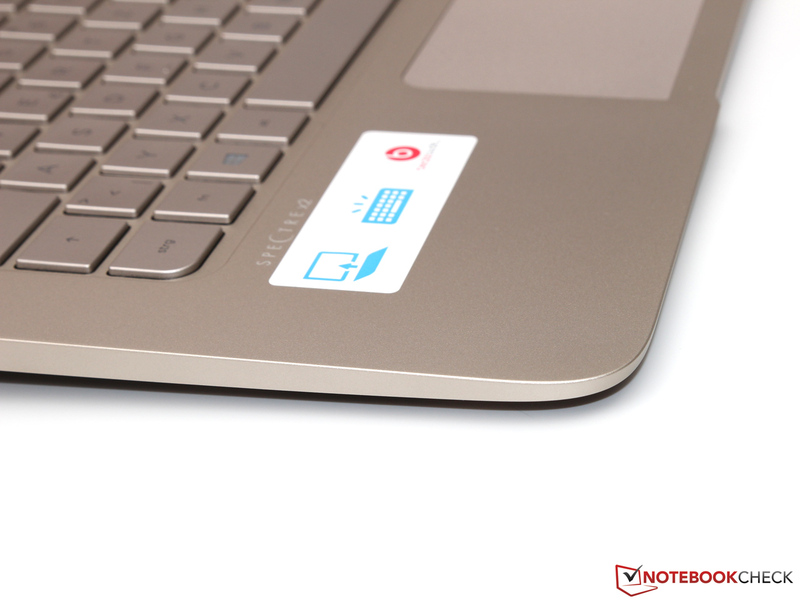 A high-resolution and high-contrast IPS display, the good keyboard, the fast wireless adaptor or the high-end SSD, HP thought of everything. 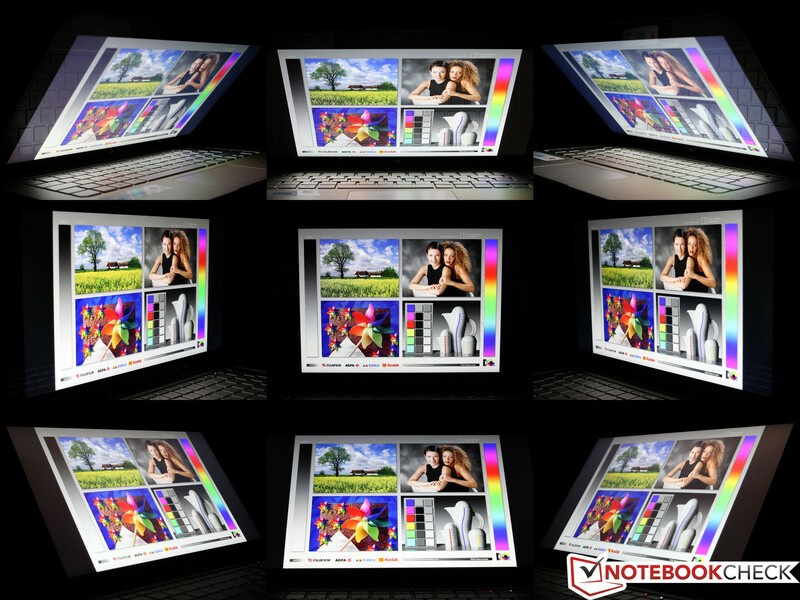 Many of the drawbacks for the notebook are a result of compromises that had to be made. The manufacturer did sacrifice a part of the (3D) performance to reduce the temperatures under maximum load - maybe annoying for some users but understandable. The lack of upgradability is also not uncommon in this category. All things considered, the price could be the final aspect for or against the purchase decision. For around 1,100 Euros (~$1485) you could get a new iPad Air and an inexpensive ultrabook - this might be the better solution for some scenarios. However, if you are looking for maximum flexibility, you will have a hard time finding better alternatives. ...no secret of its origin. The Spectre is not only a notebook. ...detaches the display and base unit. ...and results in an uneven weight distribution. 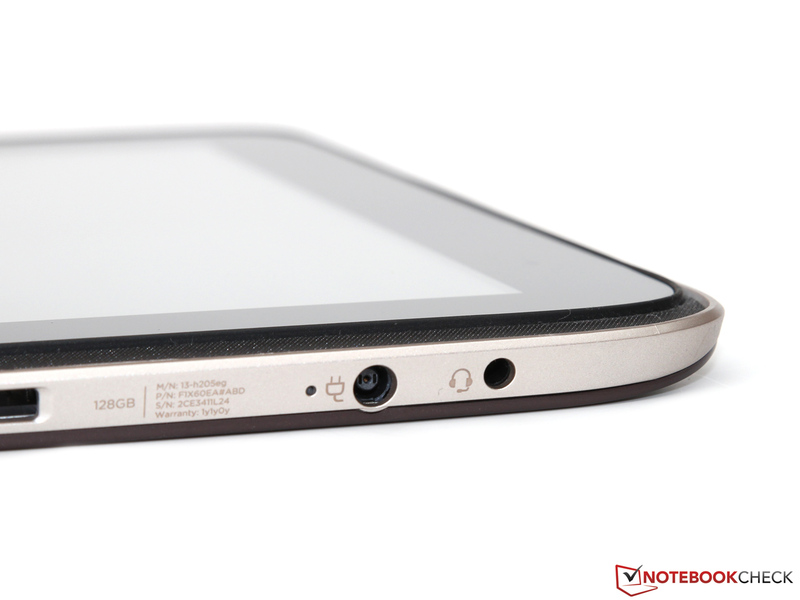 ...volume rocker are on the back of the tablet. 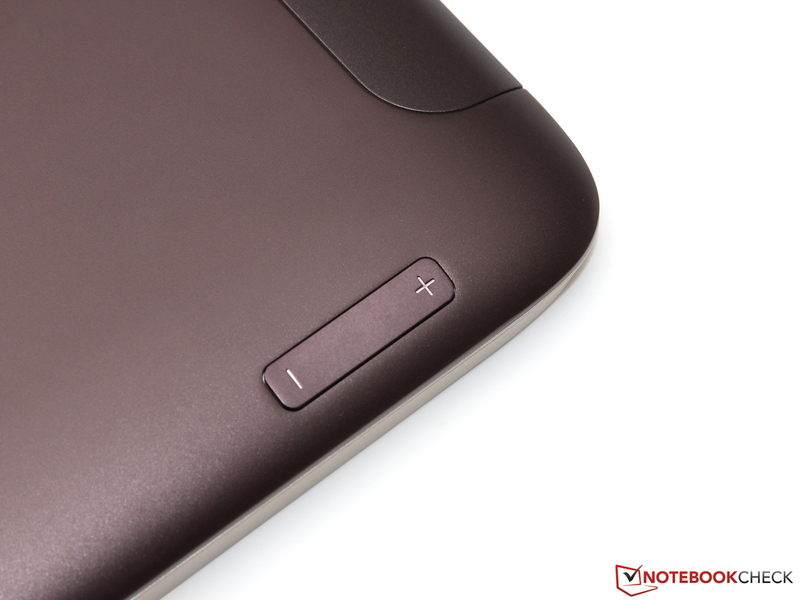 ... ,which are the only ports of the tablet besides the stereo jack. 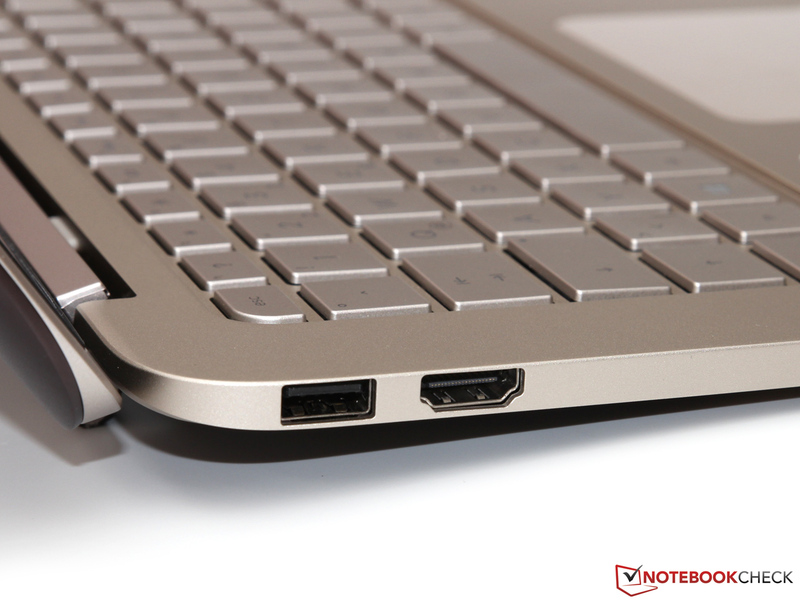 ...and two USB 3.0 ports. You cannot use the keyboard without the attached tablet. The locking mechanism is unfortunately a bit wobbly. The speakers are hidden beneath the display. 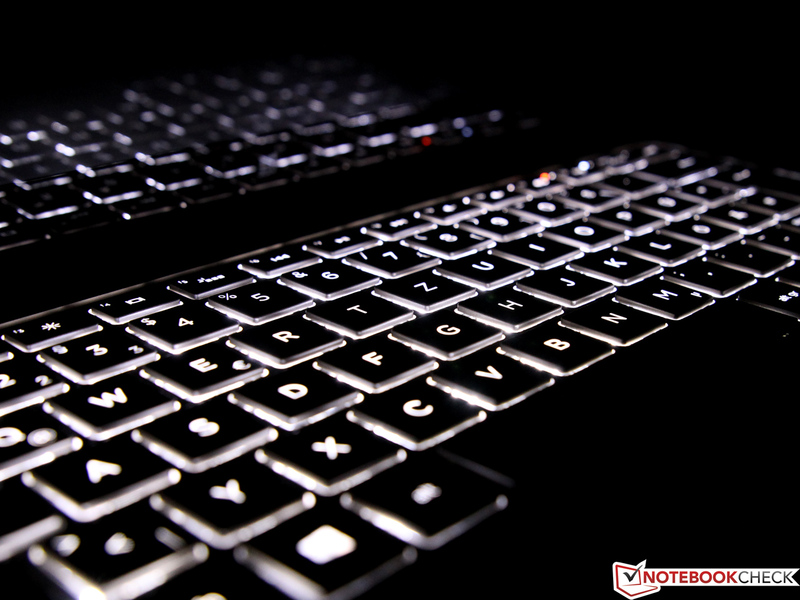 ...we are really convinced by the quality of the input devices. ...with the new Windows 8.1 preloaded. 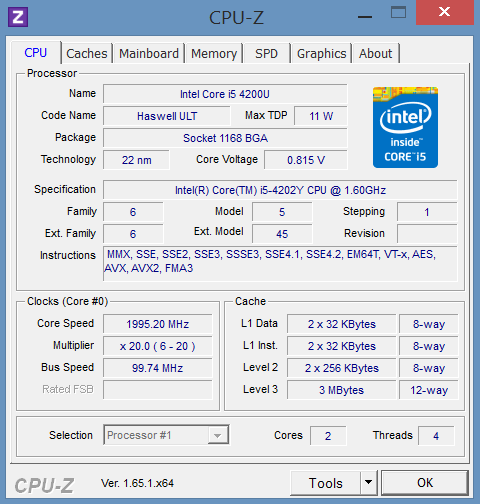 The Haswell Core i5-4202Y has a good application performance. ... so the 45 Watts PSU seems a bit oversized. 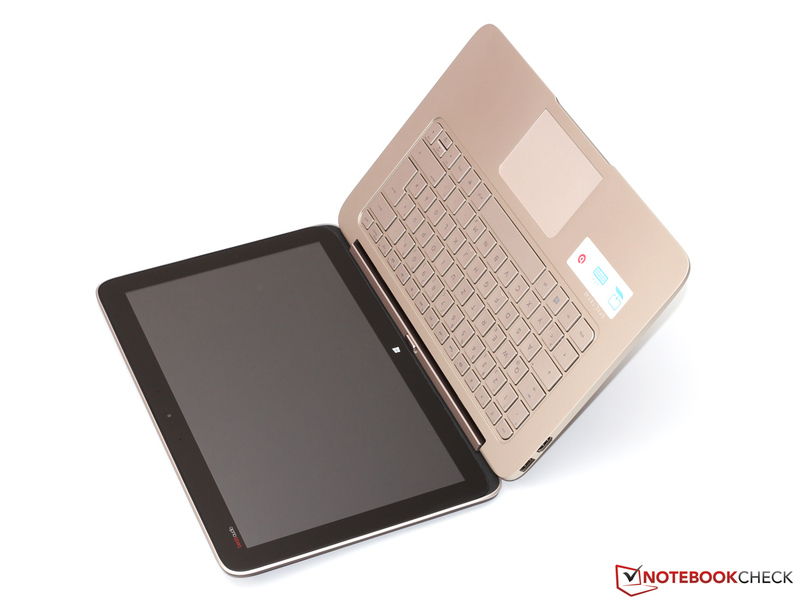 Especially the versatility, which makes a Windows tablet like the HP Spectre 13 x2 so attractive. Over the day an (almost) complete working device and a nice tablet for videos or web browsing after work. We would have appreciated a bit more 3D performance from the Core i5-4202Y - but this is also a result of HP's cautious energy management. An optional Power-Mode that uses the maximum TDP at the expense of higher temperatures would be a nice addition for gaming. A couple of years ago nobody would have thought that you could get this kind of performance without active cooling. And the development does not stop: The next efficiency jump should come with the first 14 nm chips in 2014. 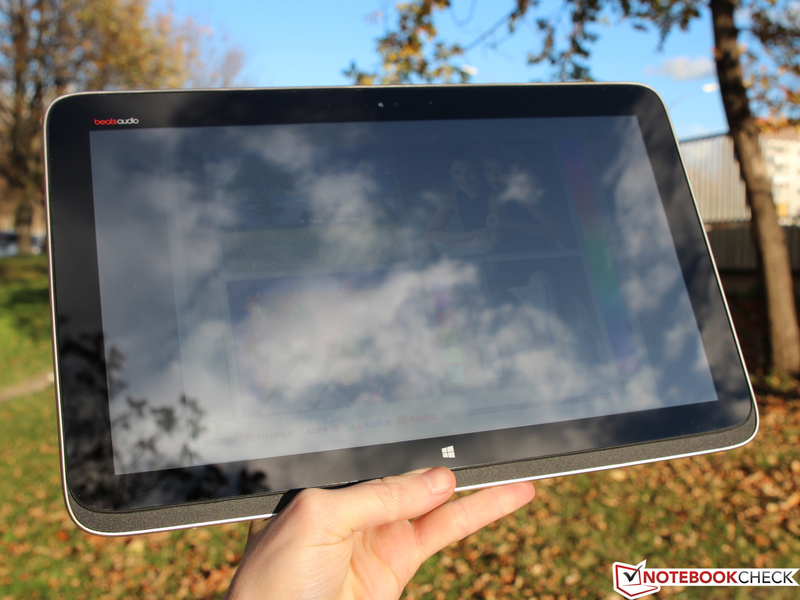 The market for Windows based convertibles/detachables is growing and anybody could find a suitable device. 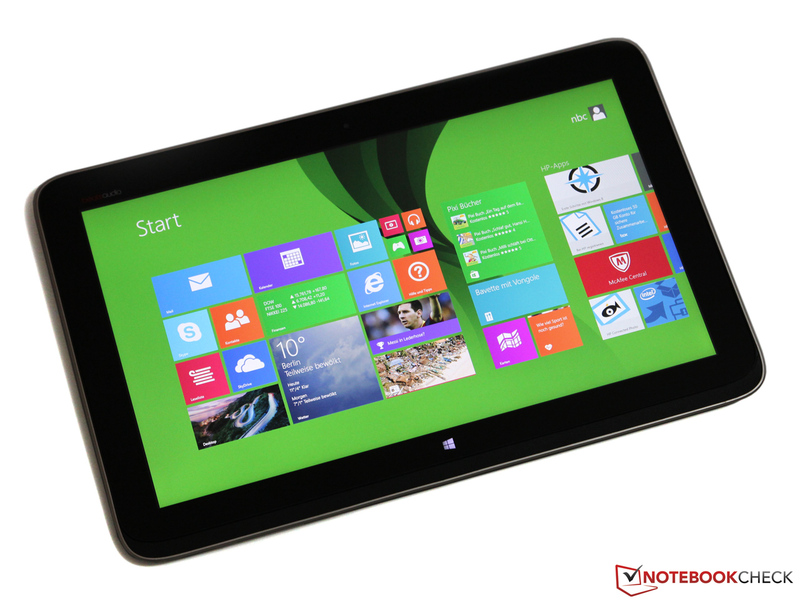 Some alternatives would be the Acer Iconia Tab W700, Asus Transformer Book TX300CA, Sony Vaio Duo 13, Microsoft Surface Pro, Dell XPS 12, Asus Taichi 31 or Samsung ATIV Smart PC Pro.